A preview of Curt's latest novel, Common Valor, is available online in both paperback and hard cover. Common Valor is available now at Amazon.com and Barnes and Noble. 1-2-16-Amazon is selling the paperback for less than half for what Barnes and Noble charges. 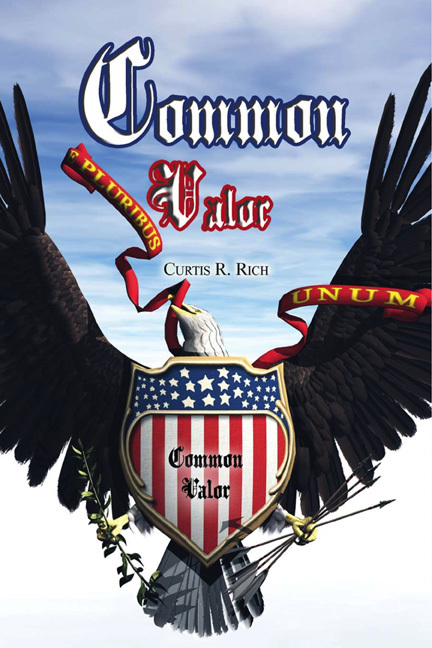 Common Valor is now available as an eBook on Amazon's Kindle, and on Barnes and Noble's Nook. If you don't have one of these devices, Apps are available for downloading them on iPads, iPhones, Android phones, PCs and Macs. I read books on my iPhone now in doctors' raiting rooms. I have autographed paperback copies for $9.95 +$4.00 s & h Contact me. If you want the hardbound, the above retailers have them. Captain Baylor's Ranger Camp--An extensive guide to Cowboy Action Shooting for beginners and/or old hands with articles and how-tos on many CAS subjects. Captain Baylor, Curt Rich's alter-ego, writes a column for The Cowboy Chronicle, the official newspaper of the Single Action Shooting Society. He is also an instructor at the SASS University and at the SASS Convention. Captain Baylor's Journal (formerly Journal of a Gypsy Cowboy) - A blog of our adventures in RVing full time and attending Cowboy A ction Shooting events around the country. This started as 2 blogs, but Captain Baylor's Cowboy Action Shooting Journal was merged into the RV Journal pretty quickly. Archives of Curt's Newsletter from October 1998 through May 2007. Look quick. As time permits, we're removing the oldest issues to make room in th website. Curt Rich retired from Star Motor Cars Mercedes-Benz on June 6, 2007 after 26 years at Star. This has been the site of Curt's Newsletter online from October 1998 to May, 2007. Since 2007 the site has been about fulltime RVing and Cowboy Action Shooting. I served in Vietnam in 1969-70 in MACV Advisory Team 70. I'm always interested in hearing from other veterans, especially members of Team 70. Original material in this website is protected under U.S Copyright laws and may not be reprinted without written permission.